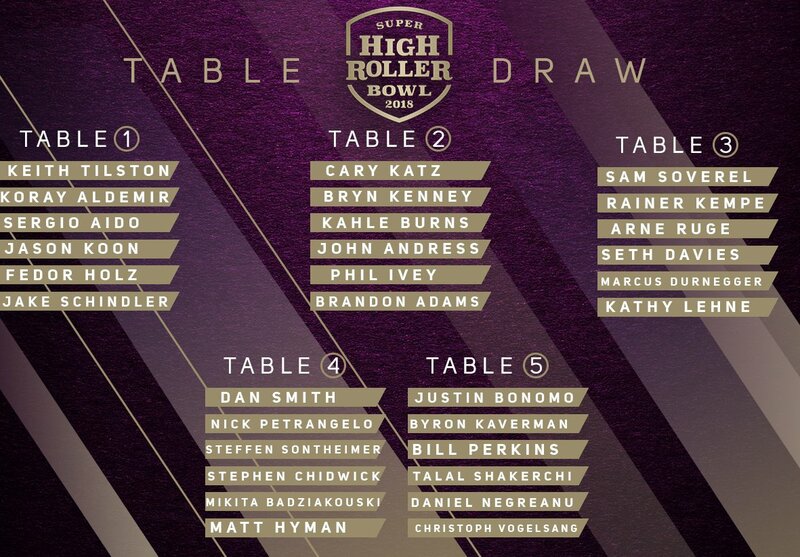 The $300K buyin Super Hi Roller Bowl at The Aria starts today and of course Daniel is in it. This is one of the biggest tournaments of the year with 48 of the best players in the World competing and all the action streaming on Poker Go. Phil Ivey is also back playing tournaments and he is also planning to play a full WSOP schedule. 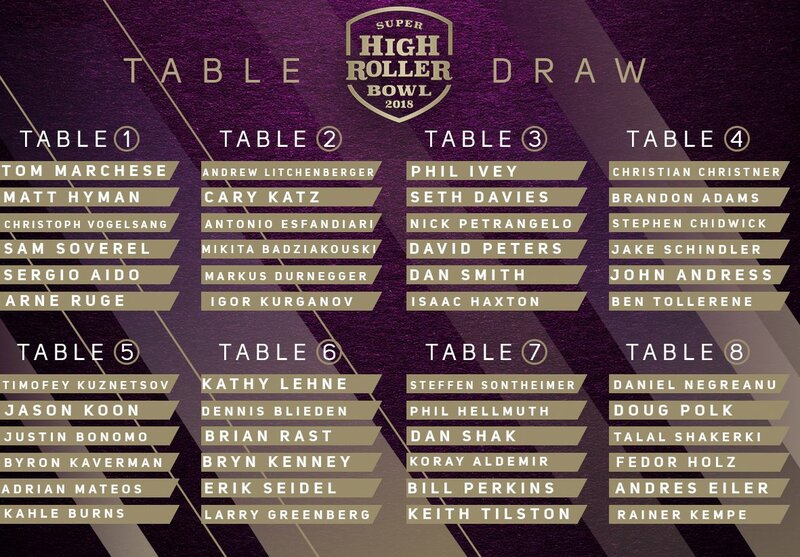 Today is Super High Roller Bowl Day! My intention is to play strong, focused poker and end the day with 600k. Watch @PokerGO and use promo code: DANIEL to save $10 on an annual subscription. One of the most decorated players in history, Poker Hall of Famer and all-time winningest player Daniel Negreanu made a strong statement on Day 1 of the $300,000 Super High Roller Bowl 2018: "I'm here to win this tournament." Negreanu stormed through the first seven levels of play in the stylish PokerGO Studio just outside of the ARIA Resort & Casino, bagging an overwhelming chip lead. The field of 48 players brought a mix of the world's elite players where Negreanu may be deemed an old-schooler. "Kid Poker," however, spent the vast majority of the last year adjusting to today's trends, working on his game to keep up with the pace of eager youngsters who spend endless hours with various game-solving programs. The approach has been paying off for Negreanu so far. He claimed on PokerGO's original show "INSIDERS" that he won $1 million when he played his first event since he started exploring the new area of the game theory drill. Now he's off to a fantastic start in the Super High Roller Bowl, a tournament he's called the most prestigious in the world. Negreanu is one of only 14 players who entered all four editions but he's failed to cash in previous years. Bagging 1,618,000 tonight gets him closer to his first notch but there's still a ton of poker to be played before the final seven players split the $14.4 million prize pool. But it's a great base camp for Negreanu whose day in the office was almost inch-perfect. He has raced out front, more than 150 big blinds ahead of his nearest competitors. Negreanu's rise to the top of the leaderboard started when he took a big chunk off Doug Polk on a double-paired board, getting the value with queens from Polk's tens. "I really came in with a specific focus," Negreanu said. "Obviously, you know your table draw beforehand. I know that Doug on my left is trying to get under my skin and he's gonna try to throw me off my game. I'm a veteran at this, I'm not gonna be distracted." Negreanu crossed 1 million in the fifth level. The only player who was chasing him for the lead was Kathy Lehne, fearless poker aficionado and the only female player in the field. Lehne had a brilliant start to the event, causing the first elimination when 2015 champ Brian Rast bluffed off his stack in the opening level, running into Lehne's nut straight. The race between Negreanu and Lehne for the overnight lead went into Negreanu's favor after he knocked out Andrew Lichtenberger with a nut flush over a set of fours to get himself a cushion at the top. Lehne eventually finished the day with 801,000, the sixth-biggest stack. Jason Koon parked in second place after winning a huge coin flip, eliminating satellite qualifier Timofey Kuznetsov to soar to 986,000. Steffen Sontheimer is on his heels with 980,000 while other big stacks feature Stephen Chidwick (888,500), Bryn Kenney (852,500), Seth Davies (738,000), and Justin Bonomo (675,500). Defending champion Christoph Vogelsang has 232,500 and 2017 champ Rainer Kempe bagged 157,000. Super High Roller bowl brings an interesting cross-over between generations of superstar players. Perhaps two of the most iconic heroes of different decades who demonstrate it the best are Fedor Holz and Phil Ivey. They'll both be back in action tomorrow as Holz finished with 522,500 while Ivey has 254,000. Day 1 saw 18 players bow out, leaving 30 players in the competition ahead of Day 2. Those who fell included David Peters, Tom Marchese, Antonio Esfandiari, Phil Hellmuth, Isaac Haxton, Ben Tollerene, Erik Seidel and Igor Kurganov, among others. Super High Roller Bowl 2018 continues Monday, May 28 at 12 p.m. PDT with the blinds of 2,000/4,000 and the big blind ante of 3,000. Come back to PokerNews for the live updates as our team will be again on the ground to provide the coverage of the immense high stakes action. Which lineup do you want to see on @PokerGO tomorrow? Daniel looked really serious and zoned in in the segments I saw whereas Polk was smiling and relaxed looking. Didn't see the hand where Polk lost a lot of his chips to Daniel though. Starting up day 2 of SHRB @PokerGO. Intention for the day is to continue to focus hard and end the day with 2.5 million in chips. 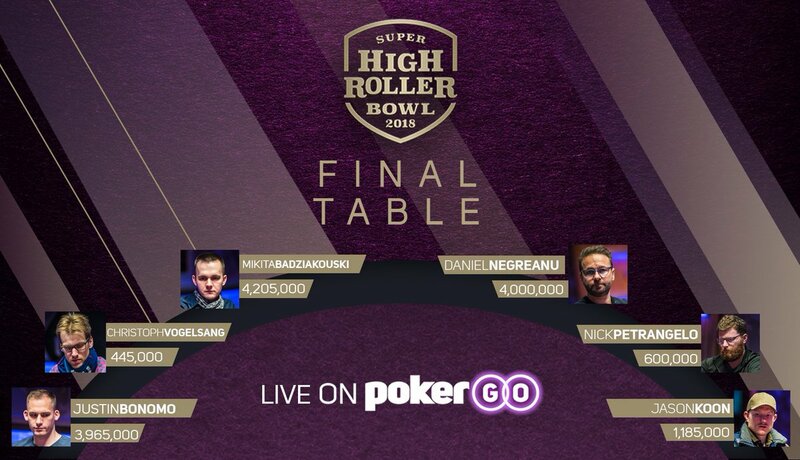 The 2018 Super High Roller Bowl is down to its final six runners in contention for the monstrous $5 million top prize, and none other than poker icon Daniel Negreanu remains in contention among the leaders. It's essentially a three-way tie at the top with high roller superstar Mikita Badziakouski holding a slight lead toting 4,205,000 into the final day. Negreanu trails with 4 million and the player with a big lead on the 2018 money list, Justin Bonomo — $8,907,138 already — has 3,965,000. Shorter stacks looking to overtake the leaders will be Jason Koon (1,185,000), Nick Petrangelo (600,000) and Christoph Vogelsang (445,000). Vogelsang advanced to his second straight SHRB final table after claiming victory last year for $6 million in a slightly larger field. It's certainly an intimidating field, with nearly $120 million in combined tournament cashes. Going into deep-stacked play — nearly 40 minutes remain at 10,000/25,000/25,000 — with the likes of Bonomo and Badziakouski represents a challenge for even the most battle-hardened player. However, it's a moment for which Negreanu has spent months preparing. "The structure being as deep as it is...I didn't work on short-stack play the entire three months of training," Negreanu told PokerNews. "All I worked on was 100 big blinds. I feel very confident that the preparation is going to pay off." "Kid Poker" said he's experienced surprisingly smooth sailing considering the ultra-elite nature of the field. "I really feel great about this tournament. I got off to a big chip lead early. I was able to hang on to those chips without having any real big adversity." A few huge hands helped. Negreanu made at least two sets, hit trips and got lucky with a straight in select key pots. However, he also made a big calldown in a tough spot against Petrangelo in one of the more memorable hands of the day. Petrangelo limped and called a big raise, flopping an open-ender and backdoor flush draw against Negreanu's top pair of aces with a backdoor flush draw and ten kicker. Petrangelo check-raised, barreled turn and then barreled river when a third spade hit the board. Holding the ten of spades as his kicker and a blocker, Negreanu called the last barrel of 580,000. "It's an interesting situation," he said. "It's a call where in 2004, if you would have said you called because you had the ten of spades, people would have said what kind of stupid logic is that? "It was before the game evolved to where combinations of cards mattered in that people understood them. I basically had the best bluffcatcher I could, so if I fold that, what the hell am I doing?" Badziakouski looked like he might bag a huge lead after a midday heater saw him far outdistance his competitors. He got lucky and flopped top set with eights against Bonomo's kings in a three-bet pot and earned a full double despite an ace appearing on the turn. Then, he flopped top set again in a four-bet pot with aces against Chidwick, who flopped a combo draw and jammed the turn and bricked. Badziakouski then had his own savage moment as he bluffed Chidwick off kings on the bubble after missing a straight draw and three-barreling off with third pair. Chidwick did manage to sneak into the money as he busted seventh for $600,000, but that'll likely be small comfort to him after he had a massive stack early in Day 3. Seth Davies also got a little money, but only $90,000 in forfeited deposits for an eight-place finish. Steffen Sontheimer was the final player to bust and leave empty-handed. As for Bonomo, he had a swingy day that included a massive sweat on the big bubble for the $600,000 payout. He got it in with ace-ten shoving over a Badziakouski open only to have Vogelsang wake up with kings. Bonomo flopped a ten and hit an ace on the river to survive, running his stack up again from there. The tournament resumes at noon with a delayed stream to follow on PokerGO and updates synched with the stream here on PokerNews. Mikita Badziakouski opened to 80,000 on the button and Daniel Negreanu made it 450,000 in the small blind with . Badziakouski peeled with . The flop came and Badziakouski called a small bet of 250,000. Negreanu checked the and then called 375,000. On the river, Negreanu checked again. Badziakouski announced 1.4 million and Negreanu quickly cut out calling chips. He looked at Badziakouski and then slammed them in, winning the biggest pot of the day. Day off tomorrow then back at it for the WSOP $100k! Will be vlogging it.